Ulun Danu Bratan Temple has beautiful scenery. This amazing temple plays an important role as a cooperative management of water resource by a group of subaks. On a sunny morning, this place offers the visitor its precious moment to capture. The beautiful water temple with its floating illusion combined with stunning scenery of Lake Bratan and the sacred golden bamboo, in the backdrop setting of blue-green mountain, is a spectacular image of Bali. Ulun Danu Bratan Temple is a water temple complex. It's located on the edge of Lake Bratan with the beautiful surroundings. Let's take a closer look to the stunning beauty of Bratan Temple! The temple was built to worship The God Tri Murti (Brahma, Vishnu and Shiva) and The Goddess of The Lake (Ida Bhatari Dewi Ulun Danu) to invoke the grace of fertility, prosperity, well-being and balance of the universe. The temple plays an important role as a cooperative management of water resource by a group of subaks. Lake Bratan, major resource of water, feed the rivers and springs throughout the year. Pura Bratan and The Lake serve the small water temples in the downstream area for each Subak. Since the 11th century century, the water temple networks have an important role to the fertility of rice terrace area along the Watershed. The water temple complex is consist of Pura Penataran Agung Puncak Mangu, Pura Telengin Segara, Pura Lingga Petak, Pura Dalem Purwa, and Pura Taman Beji. Each of which has its own character and functions. In the area of Pura Penataran Agung Puncak Mangu there are several shrines. One of them is Meru tumpang 7 (seven level of roof-overlapping temple) namely Pasimpangan Pura Puncak Teratai Bang serve as Stana to worship the god Brahma. The other shrines include Pesimpangan Pura Puncak Bukit Sangkur, Pelinggih Padma Tiga, Pelinggih Ratu Pasek, Pelinggih Ratu Pande and several other shrines. Pura Telengin Segara or Tengahing Segara has shrine or Meru tumpang 11 (eleven level of roof-overlapping temple) serves as Pesimpangan Bhatara in Puncak Mangu (Mount Pangelengan). The temple is dedicated to worshiping Vishnu and Ida Batari Dewi Ulun Danu (goddess of the lakes, and rivers). Pura Lingga Petak is located in the eastern side of Pura Telengin Segara. This temple has Meru tumpang 3 (three level of roof-overlapping temple) and exit gate at the four cardinal directions. There is ancient relic (Lingga) stored here. The temple is dedicated to worshiping Shiva. Lake Bratan Temple situated at an altitude of 1240 m asl and surrounded by holy mountain consist of Puncak Sangkur (north side), Puncak Mangu (east side), Mount Terate Bang (south side) and Mount Tapak and Mount Batukau (west side). The area around this beautiful temple is a fertile agricultural area and influenced by cool tropical climates. The temple has very beautiful scenery. While the weather is clear in the morning, this place offers the visitor its precious moment to capture. The beautiful water temple with its floating illusion combined with stunning scenery of Lake Bratan and the sacred golden bamboo, in the backdrop setting of blue-green mountain, is a spectacular iconic images of Bali. 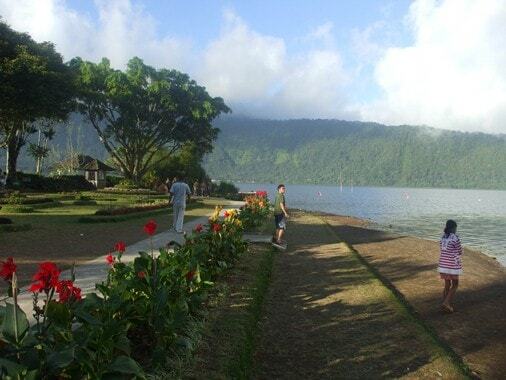 Bratan Temple and the Lake are favorite sightseeing tours and exotic photography locations in Bali. There is also tourism accommodation here such as hotels, villas and restaurants. A broad parking area and souvenir shops are also available here. You can visit Lake Bratan Temple by bus, travel car, or taxi. It's about 1 hour from Tabanan City (36 Kilometers). Visitor can also access this place from Singaraja City for about 50 minutes (28 Kilometers). But if you go straight from Ngurah Rai International Airport it took 2 hours (64 Kilometers) until you arrive at this beautiful temple. Pura Bratan, the lake, and its surroundings is influenced by cool tropical climate because of its location at an altitude of 1240 asl. Average temperature about 10-24 degrees Celsius. The humidity is particularly high. 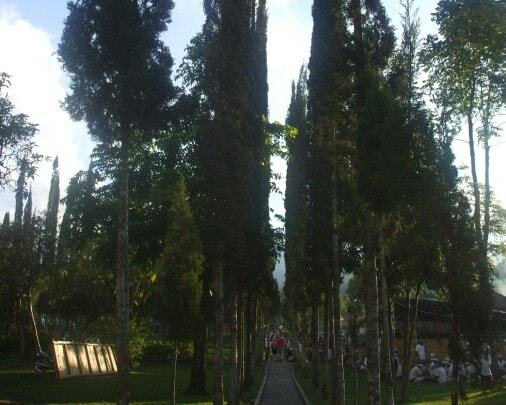 Cool breeze at the daylight is a common in the area of Bedugul. The existence of Lake Bratan Temple is mentioned in Lontar Babad Mengwi year 1556 Saka (1634 AD). 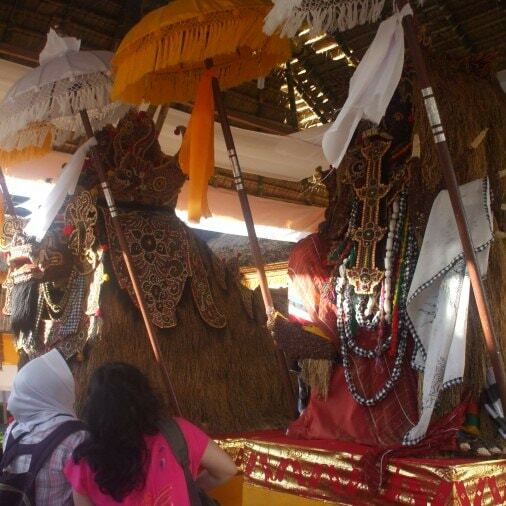 Mentioned the ancestral King of Mengwi named I Gusti Agung Putu was defeated in the battle against I Gusti Ngurah Batu Tumpeng of Puri Kekeran. Then, he became a prisoner and handed over to I Gusti Ngurah Tabanan. A duke namely I Gusti Bebalang got permission to bring Gusti Agung to Marga. After being in Marga, Gusti Agung do hermitage at the summit of Mount Mangu. Initially he was having difficulty because the forest is very dense. Finally he heard the sound of bees. He following the sound and finally arrived into location of shrine ruins including the relics of Lingga. Furthermore, the place is called Pura Puncak Mangu. In this place, he received mystical whisper with religious magical powers. After completing his hermitage, he again challenged I Gusti Ngurah Batu Tumpeng. I Gusti Agung finally won the battle. He eventually became the King of Mengwi and establishes a place of worship on the shores of Lake Bratan (The Bratan Temple) to worship Ida Batara in Pura Puncak Mangu. Pura Puncak Mangu known to have two "Penataran Temple" namely Ulun Danu Bratan Temple established by I Gusti Agung Putu is located to the west of Mount Mangu and Pura Penataran Tinggan in the east of Mount Mangu founded by his descendants, Cokorda Nyoman Mayun. Lontar Babad Mengwi did not mention about the exact time of Bratan Temple being established. But the lontar mentions about the establishment of Taman Ayun Temple in saka "Sad Bhuta Yaksa God" caka year 1556 (1634 AD). Based upon the description in Lontar Babad Mengwi it is known that Lake Bratan Temple has been established before the year 1556 Caka (before 1634 AD), by I Gusti Agung Putu. Take your time to visit Lake Bratan Temple, hopefully helpful and thank you! 1. Sangeh Bali Monkey Forest.